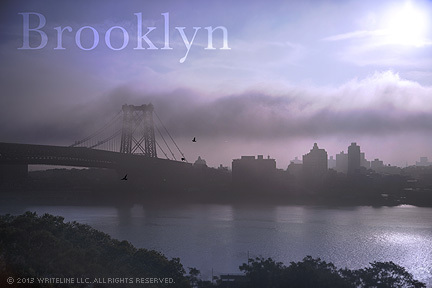 Here's the 3rd Finalist entry in the 10th Annual "Discover America Through Postcards" Photo Contest, "Fog veils the Brooklyn skyline." 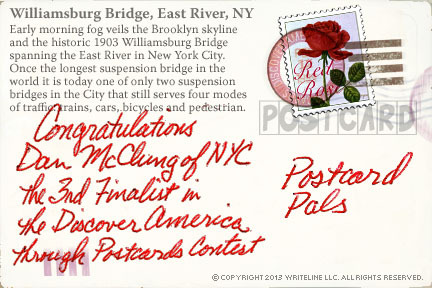 Thanks to Dan of NYC for submitting it. Early morning fog veils the Brooklyn skyline and the historic 1903 Williamsburg Bridge spanning the East River in New York City. Once the longest suspension bridge in the world it is today one of only two suspension bridges in the City that still serves four modes of traffic: trains, cars, bicycles and pedestrian. Next week one more finalist will be selected. There's only a couple more days before the deadline - this Friday, November 15, 2013, 8 PM, EST. There's still time if you submit your photo now. Photos should inspire a viewer to want to learn more about, or travel to that place. See the official rules and entry form. All finalist receive the companion book, Discover America Diaries, and the big winner also receives $100. We look forward to seeing your best shots.